Seeds contain the material needed to grow into a plant, but they need certain conditions met for germination, or the beginning of the growth process, to occur. Generally speaking, seeds do not need light to germinate and begin to grow, but plants do need light to make food later in their life cycle. Some exceptions exist, so you should check the labels of individual flower and vegetable seeds to determine whether or not light is needed. Seeds need water, nutrients and warmth to germinate. It is best if the soil is evenly moist because too little water will prevent the seeds from germinating and too much water can cause the seed to rot. Nutrients come from the soil, which should be properly fertilized. Different plants require different soil temperatures to germinate, but most seeds fall in the range of 40 to 104 degrees Fahrenheit. If you do have seeds that require light for germination, they are usually planted by sprinkling them on top of the soil so they remain exposed to light. Seeds are packed with all the nutrients the baby plant needs to sprout and reach the surface of the soil without the aid of light. The plant's roots extend from the bottom of the seed to absorb moisture and nutrients and the stem pushes its way up to the surface of the soil to reach light and air. Germination is complete once the plant reaches the surface. Until that time, the plant relies on the nutrients stored in the seed for survival. Germination may take from days to months. 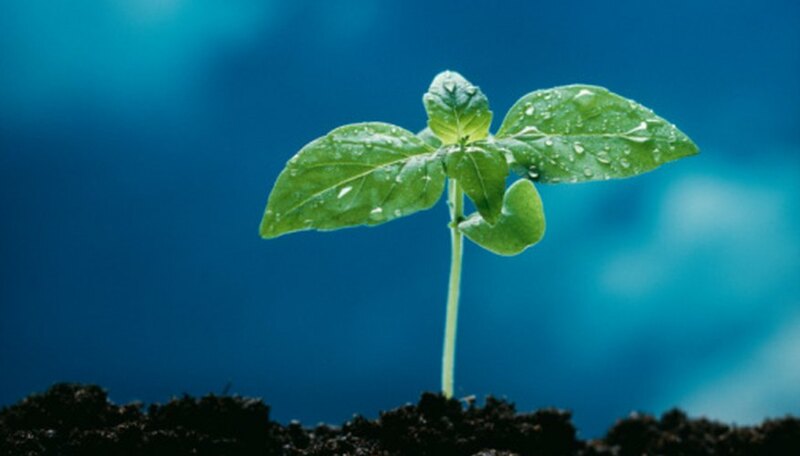 After a new plant has germinated, reached the surface of the soil and formed its first leaves, it can begin making its own food. Light is a key ingredient in photosynthesis, the process by which plants make food for energy to grow. If a young plant is not exposed to sufficient light when it has used up all of the nutrients in its seed, it will have very unhealthy growth or not survive at all. A tall and spindly plant indicates insufficient light during the early growth stages. Plants use a green pigment called chlorophyll to convert carbon dioxide, nutrients, water and sunlight into sugar. Plants can't use sunlight alone for energy. It is the chlorophyll that allows the plant to convert ingredients into a usable form of chemical energy. The plant's leaves are packed with cells that perform photosynthesis, which releases oxygen as a byproduct. Success With Seed: What Do My Seeds Need for Good Germination?